Super Strong Welds By cutting downtime caused by broken belt joints, DuraBelt can help you increase productivity and cut maintenance costs. Our proprietary welding process produces welds is up to 10 TIMES STRONGER than conventional belt joining processes. That means our welds are very resistant to breaking -- practically unbreakable welds. They are so strong that we provide the best warranty in the business. Ungouged Welds We do not gouge our belts when we grind them, so our belts do not "neck" much when stretched. 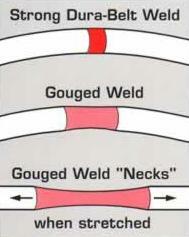 A gouged weld is the weakest link -- the thinnest part of the belt, so it focuses more tension per unit area. This produces even more necking, causing gouged belts to stretch and become prematurely limp. Our ungouged belts hardly neck so they last longer. No Regrind Regrind is waste urethane that is regularly ground up and added back to virgin urethane during extrusion. Urethane manufacturers recommend using regrind because it facilitates extrusion and improves weldability. Moreover, it cut costs. Unfortunately, the grinding process introduces impurities and breaks down long chain molecules, so regrind is an additive that corrupts virgin urethane. Regrind reduces a belt's resiliency and its load carrying capability, and shortens its life. Our proprietary process lets us extrude 100% virgin urethane without using regrind, but nevertheless improves weldability. Even though we believe most of our competitors use regrind, we do not use it in our Cyclothane belting, so we are certain that our belts are more resilient, last longer and move heavier loads -- so certain that we will send you 20 free belts so you can verify it yourself (see Most Resilient Belts Offer). Incidentally, we send our waste to a hose manufacturer. Cord made by others It is difficult for one manufacturer to produce efficiently all types and durometers of high quality urethane cord. In order to offer every type to our customers, we purchase some, e.g. rough green, from other manufacturers. We do not know if they use regrind, but experience has shown that the cord we receive has good resiliency, so if they do use regrind, they must use very small amounts, probably less than 1%. Cross-Linked HT Belts Our proprietary process for cross-linking long-chain molecules makes our HT (High Tension) belts super resilient -- especially well suited for long life and/or heavy loads in high tension applications (i.e., 20% stretch). Non-diluting Color Process Our proprietary coloring process lets us color belts after we make them, so that the colorant does not dilute and weaken the urethane. Superior Quality Control We inspect 102% of our belts (2% are inspected twice). Compliant with ISO 9000, we constantly strive for improvements. Long Warranty Having the World's Longest Belt Warranty induces us to make doubly sure that we deliver the highest quality belts. Unlike companies that have no significant warranty, we have an incentive to make our belts last longer. Proactive Technical Help Our "Belt Doctor" helps OEM's design conveyors that maximize belt life, eliminating belt problems before they occur. He also helps end-users find and cure problems that cause belts to fail prematurely, preventing such problems from occurring again. Equivalent Quality Belts Some buyers do not need belts that last longer, so we can match low-priced, low-quality belts made by others, but we exclude our warranty and do not sell them under our name. When ordering such belts specify EQB (Equivalent Quality Belts).